If you are looking for a dream home in a dream location you need look no further. This home has it all! It is located in Terra Verde which is one of the top resorts in the Disney area. The gated community has a Club House with pool, spa, tikki bar plus fitness and games rooms. You can even access the internet from here. The home itself was the model for the community and it is evident it was decorated by an expert in interior design using quality furniture and finishes throughout. It has 6 bedrooms which all Masters have flat screen television. Four of the bedrooms have adjoining bathrooms. The master is located downstairs and is of generous proportions. It has a king sized bed, walk-in closet and the adjoining spacious bathroom has tub, glass shower and vanity bar. Upstairs there are 3 more bedrooms with queen sized beds and their own bathrooms. The other two bedrooms have been decorated with kids in mind. One is definitely for your little princess with a pink color scheme and lots of bows. The other has twin beds and is decorated with a cowboy theme with lots of attention to detail. The children share a Jack and Jill bathroom. The living space downstairs is split into 2 areas. One is a quiet sitting room with white sofas. It also houses the homes large dining table with seating for six people. The other area is the lounge with large 50 inch plasma TV and comfortable seating. The kitchen completes this area. It is large and square with an island in the middle. It is fully equipped and has all modern appliances. 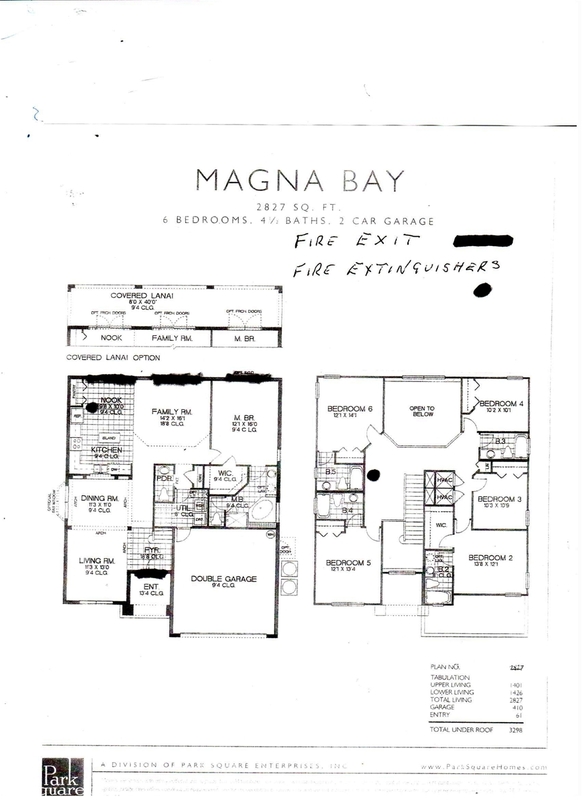 The floor plan is completed by a half bathroom and a utility room with the home's washer and dryer. A Games Room, that is fully carpeted and wood paneling has recently been added. It is sure to keep the kids amused with its flat sceened wall hung television, X Box 360, pool table and foosball game. The home is truly impressive and so is its pool area. It has a large deck, quality furniture, pool with water feature and a relaxing spa. What more could you ask for except a marvelous view? This home has that too as it backs onto the resorts fishing lake. You can relax, sip a cool drink and admire the Florida wildlife. If you want a truly luxurious base for your Orlando stay this is it! A magnificent vacation home! -Close to Disney and 192 with its range of shops and restaurants. The property was perfect for our needs and more. It was in a perfect location for everything we wanted to see and do. The kids in particular loved the pool. The title of this property is absolutely true. I had no complain about this house. There is an office which manages the entire site, so you don't have to worry about a key. You will see beautiful dinning sets on dining tables when you step into the house. All beds are comfortable and clean linens are provided. You can enjoy swimming at a pool, and playing billiards. There are a lot of chairs and sofas to enjoy talking with your friends at living room, dining room, and pool side. Kitchen utensils are more than enough. You can see beautiful sun rising from your bed. It takes only 15 minutes to go to WDW. Though there is no restaurants in walking distance, you can find many restaurants and grocery stores less than 5-10 minutes driving. The owner might be living far place from Florida, but he is very kind and full of consideration. What else do you need for your resort home in Orlando? I stayed here for three nights. If I had another day, I would have stayed at home, instead of going to WDW. Definitely I will request the owner to stay here again near future. We were looking for a home with three things in mind - convenience, (amenities, access to golf courses, etc.) 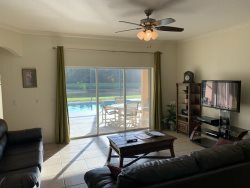 space (had several family members of varying ages and interests) and privacy (had community pool and facilities if you wanted, but private pool was WONDERFUL) -this rental met all of our needs perfectly during our two week stay. Owner was flexible and very responsive to our needs. Have recommended to several friends already and will consider for a longer stay next year. I enjoyed my stay and so did my friends . I celebrated my 40 th birthday and enjoyed every minute of it. The house was so cozy with a nice veiw of the lake. We will definitely book this home again. The house had everything we needed! Hello. Mr. Oliver. I want to thank you, we had a awesome weekend at Orlando we enjoyed every minute at you house, great place of yours. Thank you very much. Maria Hernandez.